HA NOI (VNS) — Co-operation amongst customs agencies and ministries still leaves much to be desired, said Pham Thanh Binh, a customs expert from USAID's Governance for Inclusive Growth Program in Viet Nam. Binh attributed the continuance of the country's sluggish and complex process of customs clearing to the poor inter-agency co-operation at an online conference about Viet Nam's customs practices yesterday. "There is a lack of consistency in standards and procedures during the customs clearance process," Binh said, "different sets of regulations are being applied by various customs agencies and ministries." He gave an example of how different agencies use differing methods to calculate the fee to verify goods caused confusion for businesses. Some agencies based their fees on weight while others on the value of the goods. Tran Quoc Tuan, Head of the Quality Assurance Department under the Ministry of Science and Technology, said the ministry has long accepted quality certificates sent by fax but customs agencies still refuse to do so. "If the ministry and customs agencies co-operate on this front, we will be able to remove a bottleneck in the process," he said. The Ministry of Industry and Trade (MoIT) is set to implement a pilot project that will provide businesses with electronic documents for their imported and exported goods. Certificates of origin will, however, remain in paper form as mandated by Viet Nam's international trade agreements, said Do Thi Thu Huong, deputy head of the Import and Export Department under MoIT. 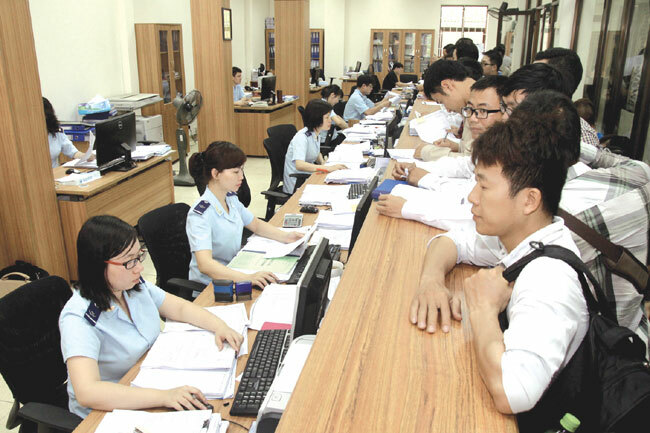 Le Nhu Quynh, deputy head of the Customs Modernisation Committee (CMC) under the General Department of Viet Nam Customs, said more procedures will be processed electronically and the department is ready to step up co-operation with other ministries this year. The department is also undertaking a survey to determine the time required for customs clearance and businesses' satisfaction level. A CMC report in 2013 reported that the average length of time for customs clearance was 115 hours, calculated from time of import entry. Of the lengthy clearance process, 32.37 of those hours were spent on registration alone. In resolution 19/2015, the Government set out objectives to improve the country's business environment. Reducing customs clearance time would contribute greatly to that objective, it opined.